What does mirroring a tree do? Mirroring exploits AncestryDNA’s tree and relationship prediction algorithms to find shared ancestors between the user mirroring the tree, the Mirror Cousin (a DNA match with a public tree), and a potential third cousin that matches. The goal of mirroring is to find Shared Ancestor Hints. Sometimes the common ancestor is shared with a close relative; other times it could be a 5th great grandparent or higher. These shared ancestors are your ancestors. Even if they’re a 5th great grandparent, that’s one couple in your tree you may have never known existed. It’s a start. Why would an adoptee mirror? If you are like me, you started down the genealogy path with little more than DNA and maybe a back story (that may or may not be correct or helpful). After your test results populated on Ancestry, you realized you officially have hundreds, or even thousands, of biological cousins. Some lucky testers immediately find parents, siblings, uncles, and more. Mirroring allows an adoptee to begin parsing the cousin information Ancestry provides. Many members have public trees. You can scroll through them, but if you have no information, they’re just names and dates. Mirroring allows you to exploit the public trees of your DNA relatives to find relationships between three people: you, your mirror cousin, and a third match (there may be many of these third party matches). All three of you share DNA. The mirror cousin and the third match share DNA and share ancestors according to their trees (now your mirror tree). 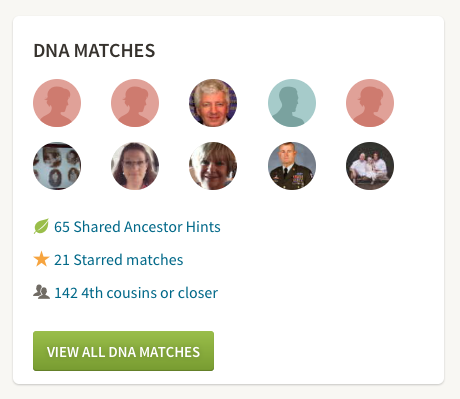 Ancestry does its magic and creates Shared Ancestry Hints. By viewing these hints, an adoptee is able to see how the mirror cousin and the third match connect. That connection is either a direct connection for the adoptee or a strong lead to an ancestor or even descendant of the couple that connects them. I had a presumed 2nd-3rd (71cM) cousin in my paternal line on FTDNA. FTDNA does not have Shared Ancestry Hints and the tree was not much help on the FTDNA site. I mirrored my Mirror Cousin’s tree in Ancestry. Once I had his tree mirrored, it was time to hook my DNA to the tree. Quick note: ancestors should only be direct ancestors in the beginning; there is no need to add anyone other than direct ancestors at this point. Before attaching your DNA to the tree, make sure the Home Person for the tree is set to the Mirror Cousin and that the Home Person is also set as you. To do this, select the tree from the Trees menu. Once in the tree, click the tree’s dropdown in the upper left, and click View Tree Settings. Once you are on the Tree Settings page, you have the option to set the home person in the tree. Again, this is the cousin that is the match in your mirror tree. You will also have the option to say that the Mirror Cousin is you. Make sure you do this. After you have set the Home Person, the next step is to attach your DNA to the Home Person. Go to your DNA homepage by clicking DNA in the main navigation menu and then Your DNA Results Summary from the DNA dropdown. On DNA page, click the settings button on the right side of the page. Almost done. Time to link up your DNA to the mirror tree. 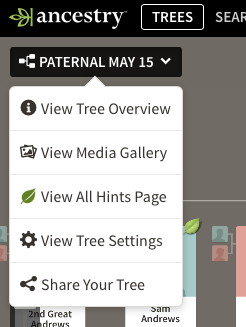 On the DNA settings page, scroll down until you see Family Tree Linking. Click Link To Tree. You will be presented with a dropdown menu that has all of your available trees. Choose the Mirror Tree and you should see something like the image below. Click YES and your DNA is now linked to the mirror tree. I’ve had Shared Ancestor Hints come in a matter of minutes. For some trees, it has taken close to 48 hours for a hint to pop up. 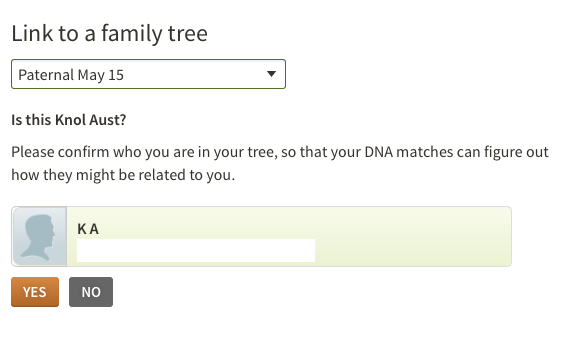 Not sure if this has to do with the tree or Ancestry’s server loads, or a little of both. After a few hours (or days) and if you’re lucky, Ancestry’s system will have worked its magic and generated Shared Ancestor Hints. Sadly, for the tree I mirrored from a cousin on FTDNA, I received zero hints after 48 hours. This could have been due to errors in the tree or maybe there no close matches. Before declaring the tree useless, I expanded his tree as far back as I could through research and Ancestry searches. I then waited for another 12 hours and suddenly 65 Shared Ancestor Hints popped up. Again, if you’re lucky, you’ll get close matches on the first round. I thought I’d hit the goldmine, but all the matches were my 5th-7th cousins. At first, those matches did not seem like much use. I knew I was more closely related to this 2-3rd cousin and that we likely shared great grandparents, great great grandparents, or 3rd great grandparents. One by one, I went through the matches and compared them to my Mirror Cousin’s line. I took note of his ancestors that were consistently popping up in the Hints. The large majority of our Shared Ancestors were ancestors of a specific set of my cousin’s great grandparent’s. All these Shared Ancestors were ancestors of his great grandparents. I put the shared for this cousin (71 cM) into my DNA Relationship Predictor and studied the options. There it was… Second cousin twice removed. His great grandparents are my 3rd great grandparents. Using the hints, I was able to place this 2c2r and determine my third great grandparents using only Ancestry’s hints. In this example, I walked you through setting up a mirror tree and showed how even distant relatives can lead to a more recent common ancestor. Don’t just mirror a match’s tree. Build it out as far as you can. Only mirror ancestors in the beginning. When starting a mirror tree, focus on direct ancestors not their siblings. When you find close ancestors, you can start adding descendants looking for familiar locations, ethnicities, or more shared ancestors. KEEP YOUR TREE PRIVATE AND UNSEARCHABLE. Mirror trees are for research. Do not leave your tree public or searchable because you could confuse other people looking for their own families or relatives. I’m about to do my first mirror trees and appreciate your post because I think I finally get how to do it. I’m just confused about one part. You said to set my dna match as the home person AND myself as the home person for the tree. Does this mean I’m creating 2 trees that are identical except for the home person? Or can you actually put 2 different people as the home person for 1 mirror tree? Thanks! I have the same question as Devanie. You have indicated that the Home Person is the Mirror Cousin whose tree you have copied. You then say “You will also have the option to say the the Mirror Cousin is you. Make sure you do this.” Please clarify. I assume the Mirror Cousin’s name goes in both places. Thanks. My husband is adopted and I had built a tree using his closest polish relative as his mother and his closest UK relative as his father and built their trees simultaneously. So I guess in a way I was making a mirror tree and didn’t even know it. Now I know how to make multiple trees and change them at will. This will come in handy. I have a fairly close DNA match who is an adoptee searching for her bio family. She’s about a 2C1R or third cousin. She and I share matches with people from my paternal grandmother’s family. Several of my male second cousins are about the right age to be her bio-dad. I gave her access to my tree so she could build a mirror tree. I don’t know if she has or not. But the info is there for her to research. I’m looking for my great grandmother’s mother and father. She was born in 1890. Without going into much detail, apparently it was a secret and I don’t even know why. So, I made a mirror tree with one of my SAH and attached my DNA to the main person in the tree. A Shared Ancestor hint on THAT tree gave me shared great great grandparents. This is the closest one I’ve gotten. Should I be excited? What should I do now? I have the same question as Devanie and Wendy above. I do not see an answer. In response to the questions from Devanie, Wendy, and Jane: He just means the same person as your home person. Under tree settings, under the “TREE INFO” tab, you have, on the upper right, the option to set the home person in the tree. Set the home person to the same person you will link your DNA to, i.e., your cousin match who is the basis of your mirror tree. Right below that option, again on the right but just below, you have the option to say “Who you are in this tree” again, pick the name you put in for your DNA cousin match, the individual you will have your DNA linked to. So- the same person as your home person. You are working on just one tree here, an exact copy of your DNA match’s tree, with “you,” (actually your DNA cousin with your DNA attached) at home base. I have repeatedly tried to do the steps—I get to the map—but can’t find or access any “settings” button there. Have things changed at Ancestry? I just stumbled across this earlier this week—it’s August 2017—and I had my DNA test done a few years ago. The Settings option is still in the same area. Ancestry no longer shows the map in the header of the DNA page. It’s in the top right corner on your DNA profile… In the brown/gray box where your name is shown and it says “Hello, XXXXX”. Thank you for the info. I was having trouble understanding the steps based on other directions that I read, but I understood all the steps that you listed. Got a mirror tree set up tonight! Someone told me that she accepted that a cousin uses her tree as a mirror. But it messed “the relationship that she has for her DNA” up (exactly what she said). Can it be possible ? If so, how to make sure it doesn’t happen ? It can mess up how Ancestry shows the relationship in Shared Ancestor Hints but won’t actually alter the amount of shared cMs/DNA. If the person attaches their DNA to the DNA match, Ancestry will show a hint that they are siblings even though the shared DNA remains the same.